WESTBROOK — My Place Teen Center served more than 9,000 hot meals last year. Now the center is using that service to teach members the ins and outs of food preparation and restaurant management. Under the guidance of chief and instructor Jesse Blaisdell, the center began a restaurant job training program this fall. Students in the five-week program meet at the Main Street center after school and help Blaisdell with food preparation. Once dinner is ready, they seat the diners and serve the meals. Then they bus the tables and assist with cleanup. “Each kid has a different job every week, so they get some real insight on how restaurants function,” Blaisdell said. Sheylan Hamm, 14, of Westbrook, said she likes washing dishes. “I like coming here everyday because it gives me something to look forward to and I like the people I work with,” she said Monday before helping Blaisdell prepare food for her peers to deliver to tables. The meals typically gravitate towards American fare and Italian cooking, Blaisdell said. This week the center was set to offer turkey pot pie, squash, stuffing, mashed potatoes and cranberry sauce on Monday; macaroni and cheese, baked beans, coleslaw, potato salad and watermelon on Tuesday; chicken Parmesan, pasta, tossed salad, fruit salad and pastries on Wednesday; turkey chili, brown rice, cornbread, melon and pastries on Thursday and a pizza party on Friday. Meals are offered year-round. My Place Teen Center President and CEO Donna Dwyer said bringing Blaisdell in has allowed the center to expand the meal program into a learning opportunity for the teens. Dwyer said the center typically feeds 40 to 50 teenagers a night. “We have always served food, but we wanted to do something more with it and have a whole curriculum around it,” Dwyer said. “We never had a chef in the kitchen. It’s been me and volunteers doing the cooking. We have a chef, a guy who has been in the restaurant industry, in the kitchen on an everyday basis”. Blaisdell has been working on and off at restaurants since he was 14, most recently as a chef at Nosh Kitchen Bar in Portland. He has worked in restaurants in California, Colorado and New York. Mark Woodbury, a volunteer and member of the My Place Teen Center advisory council, said the program has been a great learning opportunity for the center’s youth. 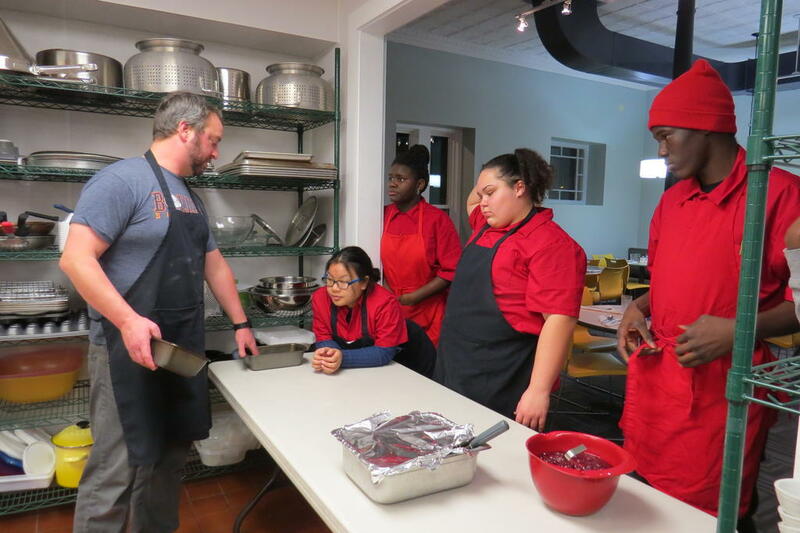 “This experience teaches the kids about working together, setting the table correctly, working with different equipment, talking to people they don’t know — all the elements of running a restaurant — while at the same time preparing them for future jobs and learning humility,” he wrote in an email to the American Journal. Blaisdell said the program has gone well so far. My Place Teen Center Youth Program Cooking Instructor Jesse Blaisdell, left, speaks to Rosie Le, Lordes Paulo, Sheylan Hamm and Raimundo Lubota, participants in the center’s restaurant job training program, prior to dinner Monday. Lordes Paulo takes orders for dinner Monday at My Place Teen Center. Turkey pot pie with squash, mashed potatos, stuffing and cranberry sauce was the offering. The center provides dinner for 40 to 50 youth a day. Raimundo Lubota fills waters before other his participants in the restaurant job training program go table to table taking orders.